Welcome to the YourCityGuide.net Tutorial! There are a few things you should do before proceeding with marketing the site and selling listings. Make sure you complete this list as soon as possible. Sign up for Paypal (if you haven't already) - It's free! Plus it is your means of accepting credit cards. Just go to www.paypal.com and get a business account. Then be sure to verify the email address you use with paypal, with your email address on file under "Edit Site Settings"
Verify Site Settings - In the site manager menu, click "Edit Site Settings". Be sure that all information is correct, set your listing prices, setup your 'In the Spotlight' site. Especially be sure that the Paypal address is the valid email address you have set up on your Paypal account or customers will not be able to properly pay. After logging in, click on "Mailboxes" and then "Add New" (below the current mailboxes on the right). Fill out the form with the desired email and password. If you wish to redirect the email sent to this address to your current email for convenience, tick the box and enter your current email. Otherwise, just set up as normal. If you are setting up the email in your email client, use 'mail.yourdomain.com' as both the POP and SMTP (Incoming and Outgoing) server and use the full email address (newemail@yourdomain.com) as the username, and the password you set up as the password. This should allow you to send and receive email to and from your new address. 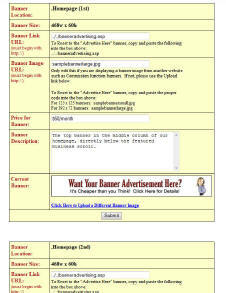 Set Banner Ad Prices - There are many banner spaces on your website you can sell to earn additional income. Click "Manage Banner Ads" and set the price of each banner. Don't change the banner or links until you sell a banner as they will help you sell them. Sign up for Commission Junction - Your website is programmed to earn you additional money without doing anything. All you have to do is sign up for a free Commission Junction account and input your CJ ID in your site settings. Click on the "Commission / Affiliate" link for full instruction. To edit general settings such as your email address, phone number, price for your site and more...just click on the "EDIT YOUR SITE SETTINGS" link. Be sure all information is correct and edit anything you need to edit before submitting the form. There is a short description of each of the fields in the form to help you out. The links on your website are able to be reordered how you like them. Just click the ▲ to move a link up, and the ▼ to move a link down down. Click the button to edit the button title. "Editable Link/Page" - Use this if you want to add a blank page to your website that you can add content to using the WYSIWYG Editor (What You See Is What You Get). If functions just like Microsoft Word and allows you to customize your text size, color, add pictures, and more. (see the next section of the tutorial for more info on the WYSIWYG Editor). Want to add a "Community Pictures" page? Just use the "Add Editable Link/Page" form to enter the Link Title and it is created instantly. Then just click the "Edit Page Content" link (next in the tutorial) to use the WYSIWYG editor to add content. You can create a page about anything, user your imagination...content only makes your website better. "External Framed Link" - Use this form if you want to add a link to any external website. An external website is any website that isn't yours, for example the local Chamber of Commerce or local Visitors Bureau website. When you add a link using this method, it will display your logo and links at the top of the page, and display the external page in a frame below them. This serves the purpose of allowing the user to browse the external site, but still keeping them on your site and allowing them to navigate back if they choose. No sense driving them away...right? "RSS Feed Page" - The last kind of new page you can add to your site sounds complicated, but it really is not. It is called an RSS Feed Page. An RSS feed is basically a data stream that is provided by certain websites (local newspapers often offer them) that you can display within your existing website design and they appear as part of your website. They are constantly updated by the provider so you have fresh content on your website and don't have to do anything. The news and recipes on your homepage are examples of RSS feeds. I've given you the opportunity to add RSS Feed pages to your site as well. It's easy to find RSS Feeds...just go to http://www.rssmicro.com and find a feed you want to add to your website. When you find the one you want, just copy the green url (including the http://) - see screenshot below. Then paste it into the Add RSS Page form in Link Manager. Add your Link Title, submit and you're done. This is where you will edit the content on the pages of your website. Just click the title of the page you wish to edit and you will be taken to the editing page. This section allows you to review submissions waiting for approval plus view, edit, and delete all of the listings already appearing on your site. You can also easily contact any of your members from this page by clicking their email address. Review - Once you have verified that payment has been received, log into site manager and click "Review" next to the listing you would like to review and/or activate. Verify all information, enter a listing expiration date, etc...then submit the form make the listing go "Live" on your website. Delete - Click this button only if you want to permanently delete this submission from the queue. CAREFUL...THIS CANNOT BE UNDONE! Auto E-mail - Use this feature to resend the confirmation email containing a customers username and password. A quick and easy way to get that information to someone who has lost their username and password information or didn't receive the first e-mail. Edit - To Edit one of the listings, just click the "Edit" button to the right of the listing you want to edit. You will then be taken to a form that will have all of the listing information in a form for you. Just edit the information you want to change and click "Update". It will instantly be updated in the listing. Delete - To Delete a listing from your site, all you need to do is click the "Delete" button next to the listing you want to delete. It will ask you "ARE YOU SURE YOU WANT TO DELETE THIS LISTING?" Either click "OK" to delete it or "CANCEL" to cancel the deletion. 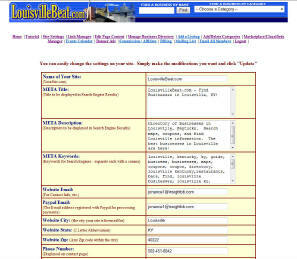 This area allows you to edit/delete the Non-Featured Yellow Page Listings on your website in case the need ever arises. Just enter all or part of a business name into the search box and submit. You will see a listing of matching businesses, along with Edit and Delete buttons just like with the Featured Businesses. If you sign up a business in person, or for any other reason need to add a business yourself, simply use this feature to do so. 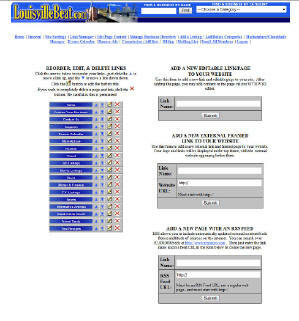 There is also an option to add a free yellow page listing. Allows you to review your website categories, add new ones if needed, and delete existing categories. Generally speaking most businesses should fall into the existing website categories, but this gives you the option if you feel the need to add a new one. This is where you manage the items for sale posted on your website. You can view all items posted by both Featured Businesses as well as Free Classified users. Just click on "Manage your Marketplace" to go to Marketplace manager. You will see a listing of items in your marketplace. To delete an objectionable, fraudulent or out of date listing, just click 'Delete' next to the item in question. Click an item name to view the full item description page. Finally, if you want to view or delete a Free Classified user for any reason, just use the link provided. Another profit generating feature on your website is the ability to sell banner advertisements. Your website is already preloaded with banner ad spaces ready to sell. Banner Ad Manager allows you to upload advertiser banners, set prices for ad space, even create your own banners online. There is a link at the top of Banner Ad Manager to Create your own banners. Use the online banner maker to create impressive banner ads for your clients. You can preview the banner as you go, and finally save it to your hard drive when finished so you can upload it to your website. In Banner Ad Manager you will see a form for each banner on your website. At the top is a description of where the banner is located (ex. Homepage 1st or Business Directory Bottom). Find the location you would like to upload a new banner to, and click the "Click Here to Upload a Different Banner" link. You will be walked through the banner upload process. Be sure the banner image you upload is the correct size. You obviously have complete control over the pricing of your banners. I have set default prices which you can feel free to use or change to your liking. If you would like to change the price of a banner, simply scroll down to the location you would like to change, edit the price, and submit the form. If you have uploaded a banner ad and would like to display the "Advertise Here" banner again, simply follow the instructions in the Banner Link URL and Banner Image URL boxes and submit the form. Earn Money the Easy Way! We have preloaded your website with several affiliate programs designed to earn you a commission if someone clicks through from your website and makes a purchase. All you have to do is sign up for the free program! Plus we give clear instructions on how to sign up for new affiliate programs and add their banners or create links on your website. Visit the Commission / Affiliate link for detailed instructions. 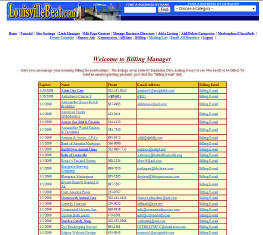 Billing Manager allows you to view the expiration date of all your Featured Businesses. We've made it easy for you to track the status of your Featured Businesses, and have even provided a "Billing E-mail" link to send expired businesses, or businesses whose Paypal payments have been cancelled, a billing notice. Just click that link, and on the next page, we've pre-populated a form. You can just hit send, or change the wording if you wish. Upon submitting the form, the business will be e-mailed the notice containing a link for them to renew their subscription. Keep up with your website visitors and keep them coming back! Your website comes with a mailing list signup form in the right hand column of every page on your website. Use the mailing list manager to view your members and send out emails to all of them. Use the same username and password to login to Mailing List Manager as you do to access your Site Manager. If you want to e-mail all of the members of your website at one time, we have made it easy for you. Simply click the "Email All Members" link. On the next page is a text box containing the e-mail addresses of all the Featured Businesses on your website. Simply highlight them, copy, and paste them into your favorite e-mail client (Outlook, Outlook Express, Eudora).